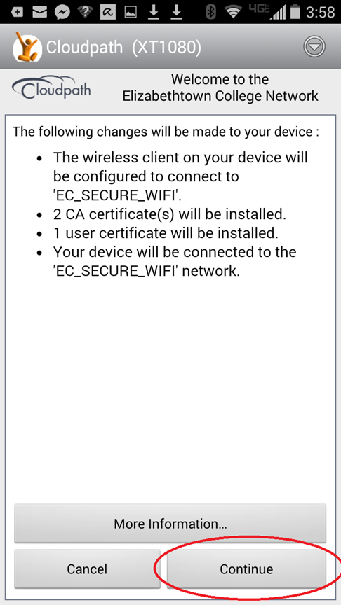 How to connect your Android device to EC_SECURE_WIFI. 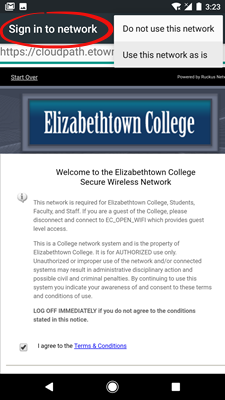 This is a secure wireless network that is available to anyone with an E-town username and password. Your computer must be also registered before you can access the network. 1. 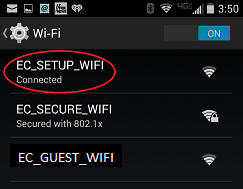 Open the Wireless menu on your device and connect to EC_SETUP_WIFI.2. 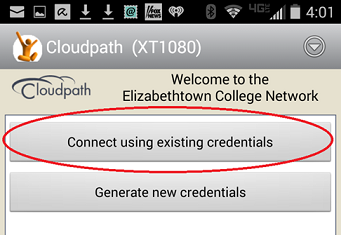 Open a web browser, visit https://cloudpath.etown.edu, and follow the on-screen prompts. 3. Enter your username (without @etown.edu) and password. 4. Follow on-screen prompts to install the certificates, then manually connect to EC_SECURE_WIFI. 5. 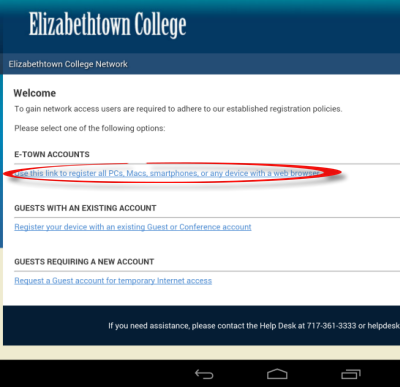 Visit update.etown.edu and follow the prompts to register your device. To learn how to connect your E-town email with your device, click here. Because of the open nature of the Android system, some phones will have different screens or options, but most Android phones follow a similar format. If you run into a problem, follow the instructions for Troubleshooting. If you are still experiencing a problem, please contact the Help Desk. Step 1: Tap Settings on the home screen. 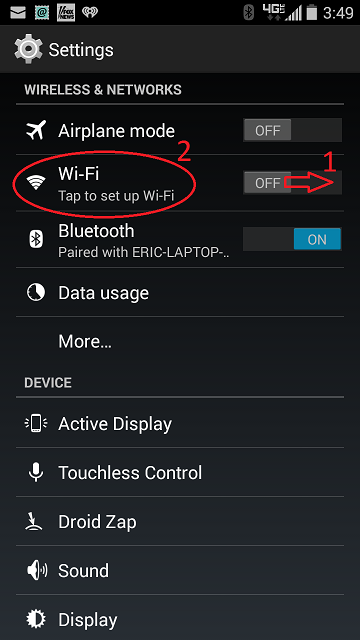 Step 2: Make sure your Wi-Fi is toggled ON, then tap Wi-Fi. Step 4: A web browser will open to cloudpath.etown.edu. Press Start. 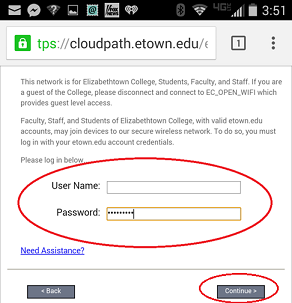 If the browser does not automatically open to this page, type cloudpath.etown.edu into the address bar. 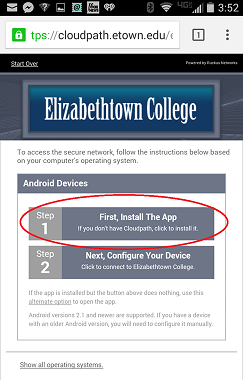 Step 5:In some cases cloudpath.etown.edu will open in an incompatible browser. 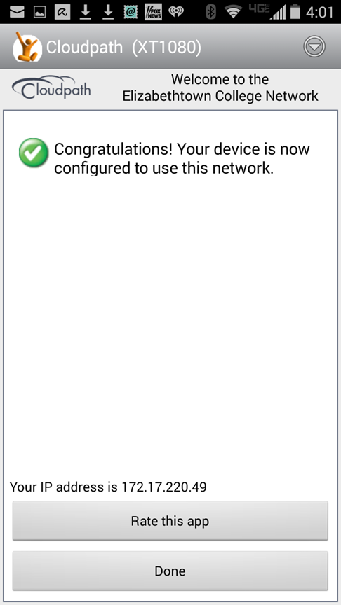 If you notice Sign in to network in the top left corner, select Use this network as is. 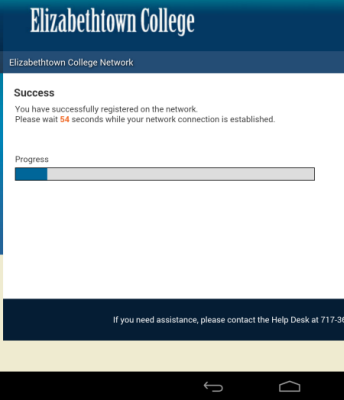 Step 6: Enter your E-town network username and password. Tap Continue. 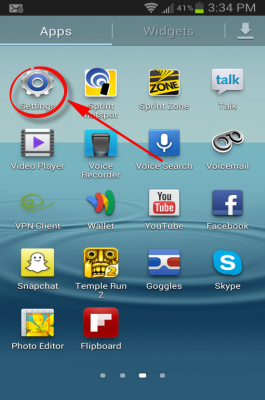 Step 7: Tap First, Install The App to begin configuring your device. 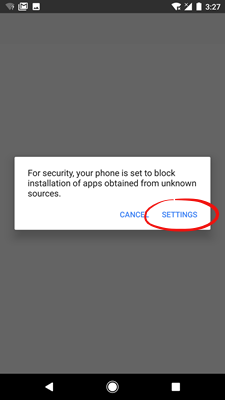 Step 8:If you receive a security notice, you will need allow the installation of the app in Settings. Step 9:Install the Cloudpath App. Some Android devices may require you to verify install. Simply click install. 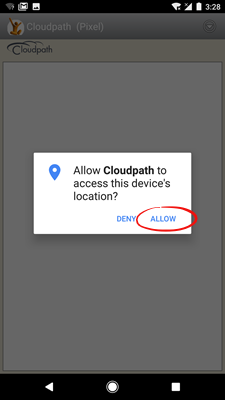 Some Android device may require that you allow Cloudpath access to your device's location. Click Allow. Step 12:Return to your browser and select Next, Configure Your Device. 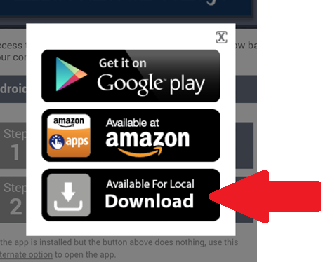 If clicking Step 2 doesn't work, press the alternate options link indicated by the arrow. Step 14:Press Connect using existing credentials. Step 15:You should be connected to the wireless network. 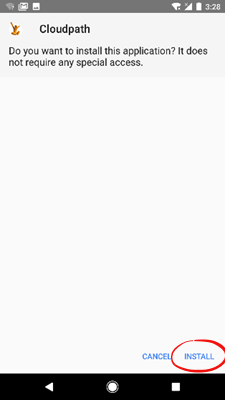 Step 16:Open your web browser. If your device has not been registered, you will see the Acceptable Use Policy. Scroll to the bottom and tap Agree. Click the link under E-town Accounts. 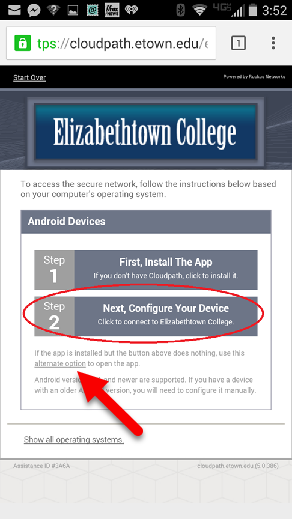 Enter your Etown network username and password, then tap Continue. Wait while the connection is configured. Step 20:Click OK after the connection is established. You will have to close and reopen the browser. 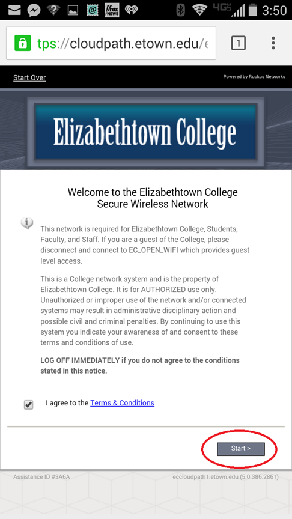 In some cases, the browser may still be unable to use Etown's network. If this is the case, either turn wifi off and on again, or restart the phone. You do not need to go through the registration process again.